At the end of each presidency, the Smithsonian partners with the White House to commission official portraits of both the President and the First Lady. Two sets of the portraits are then printed: one for the White House and another for the National Portrait Gallery. This week, the Obamas announced who they have selected to paint their individual portraits. Michelle Obama has chosen Baltimore artist Amy Sherald. 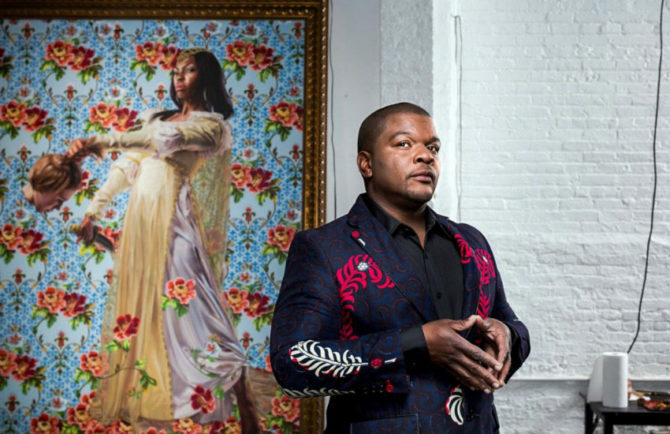 Meanwhile, former President Barack Obama has selected Los Angeles native and openly gay artist Kehinde Wiley. Over the course of his career, Wiley (b. Los Angeles, 1977), whom President Obama selected, has frequently portrayed young African American men wearing the latest in hip-hop street fashion. His rich, highly saturated color palette and his use of decorative patterns complement his realistic, yet expressive, likenesses. The theatrical poses and props Wiley assigns to his subjects make references to iconic portraits of powerful figures by Western artists. Sounds like the perfect choice to paint the portrait of the United States’ first Black president! Some of the cultural figures Wiley has painted over the years include the Notorious B.I.G., LL Cool J, Big Daddy Kane, Ice T, and Michael Jackson. The Portrait Gallery is currently raising funds for the portraits, which will be unveiled in early 2018. I’m kinda partial to Ice T as Emperor Napoleon. Obama picked a great artist, no surprise there. Brilliant choice, both aesthetically and politically. I hope there will also be a subtext to Obama’s painting, i.e. another famous character. Thank you Barack for picking the best artist, the paintings are beautiful! I recently had the pleasure to view two of Kehinde Wiley’s portraits in the PAM. His work really is vibrant and stunning. An underlying idea in many of his works is that he paints ordinary people (you make the list) in traditionally power poses (poses from classical European paintings of royalty and nobility). I don’t find Obama to be very ordinary, but I’d love to see what pose Obama picks. I’d love a copy, please :).